, Harrogate - located within the beautiful North Yorkshire spa town of Harrogate and forms part of The Academy health and fitness club. In an increasingly hectic and demanding world, its mission is to ‘create a haven for the individual to refresh the body, relax the mind and renew the spirit'. luxurious Spa is one of the largest in the country, and its Good Spa Guide ‘5 Bubble Luxury Spa’ status heralds it the best in the North of England for Spa days and Spa breaks. The spa journey takes you through experiences which enhance circulation and boost the immune system, leaving you feeling healthier and re-vitalised. No spa day or spa break is complete without a visit to the new spa garden, blending indoors and outdoors for when you need an extra touch of tranquillity. , Harrogate. 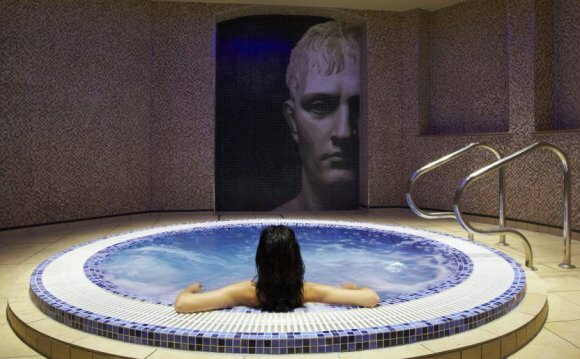 Rudding Park's highly acclaimed Harrogate Spa offers you the opportunity to relax and unwind. The Spa has four treatment rooms, including a hammam, beauty area, steam room, experience shower and two relaxation areas. Their extensive range of spa treatments and packages use three luxurious product ranges: CARITA, Spiezia and Aromatherapy Associates. , York - The spa within the luxury Grand Hotel is set in the hotel's atmospheric vaults where the North Eastern Railway company once stowed its millions. The thick vault doors make ideal soundproofing - a true escape from the hustle and bustle! The Spa offers a stunning range of therapeutic and rejuvenating face and body care treatments, using excellent products from top European skincare house Espa. , Skipton - With state-of-the-art facilities including a 15m indoor swimming pool, thermal suite, gym, fitness studio, 8 spa treatment rooms, relaxation area and a stunning outdoor spa pool and terrace the Coniston Spa is truly a luxurious offering. The Spa is adjacent to the hotel, standing proud amongst the trees and over-looking the lake. This peaceful setting is the perfect place to relax, blending both the inside and outside together. There are a variety of Spa day and Spa break packages available. The Sunday Spa package offers excellent value. Recently awarded the best Leisure and Spa Hotel by Signpost Hotels. , Alne - One utterly amazing spa and leisure club. There's quite simply so much to do, in such a lovely environment. And when you've done your pulse-pumping work out, the relaxation fairies get to work, gently lulling you into such a state of calm, you never want it to end. Hotel guests, pamper day guests and leisure club members have exclusive use of this wondrous health club. But be warned; you may want to stay forever. , Helmsley - Situated on the edge of the North Yorks Moors in the picturesque market town of Helmsley, the Verbena Spa has won the coveted 5 bubbles from the Good Spa Guide and named one of Tatler's 101 Spas of the World. Spoil yourself and escape the pressures of day to day existence - a range of Elemis treatments and packages await you, as well as the heat experience - including saunarium, steam room, salt inhalation room, footspa, outdoor heated pool and outdoor hot tub. Alternatively, relax on the generous soft seating or in the South-facing terrace garden. , near Skipton - Pure Spa is a sanctuary where you can melt away stresses and strains and revive your body and soul. Our spa menu includes Elemis spa days, facials and body therapy and a variety of beauty treatments including waxing, threading and tinting. l near York - Set in six acres of beautiful formal gardens and only 15 minutes from the historic city of York, Cloisters Spa facilities include a 16 metre swimming pool, jacuzzi, state-of-the-art gymnasium, sauna, stream room, and aromatherapy salt room. , Skipton - Offers a haven of peace and tranquillity in the unique setting of a historical barn on the 33, 000 acre Bolton Abbey estate. Fresh air, relaxation and true well-being are just some of the reasons why people choose to come again and again. With pool, spa pool, sauna and steam room, as well as Elemis beauty therapy you will not want to leave. , Masham - Swinton Park spa is an oasis of calm - a peaceful conservatory bathed in warm natural light with lush tropical vegetation. The Jacuzzi pool is set in its own deck, with the relaxation zone at ground level and the sauna and shower recessed into the outer wall. Guests enjoy total privacy - treatment rooms are discreet and subtly furnished, all complemented by the expansive and serene surroundings of the hotel and grounds. , Scarborough - Situated within the 4-star Crown Spa Hotel offering the perfect sanctuary for a well deserved pamper and relaxation session; our professional and friendly therapists will help to redress the balance of your mind and body leaving you completely revitalised. - At Harrogate's Turkish Baths & Health Spa, amidst surroundings that are pure Victorian, The Baths' Moorish design with great vaults and arches soar to a high arabesque ceiling ornately decorated with colourful stencilled design. - The exclusive Women Only wellbeing retreat providing a tranquil luxury environment for our life transforming programs – all designed to help you take control of your life, your health and your emotional well-being. Our holistic approach uses powerful life coaching techniques, yoga and meditation combined with gentle detox and the energy of healthy, nutritious gourmet raw food. For indulgence, guests can enjoy . Here you'll find an authentic yet contemporary country estate retreat. A place for guests to eat and drink in the restaurant, unwind in the treatment rooms or wander the country estate. With a full menu of massages, body wraps, and facials from carefully selected natural, sustainable and organic skincare products.